Al Mar SOG with black Micarta handles and marked SEKI-JAPAN. It is mint with the great original sheath and box. The blade is 6-1/2" and it is 11-7/8" overall. Model 4008-A1. 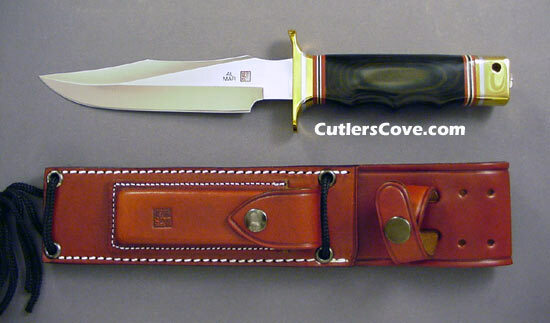 It comes with the original fine leather sheath made by Tex Shoemaker & Son of San Dimas, California. The sheath is brown leather with stone and pocket on the front. 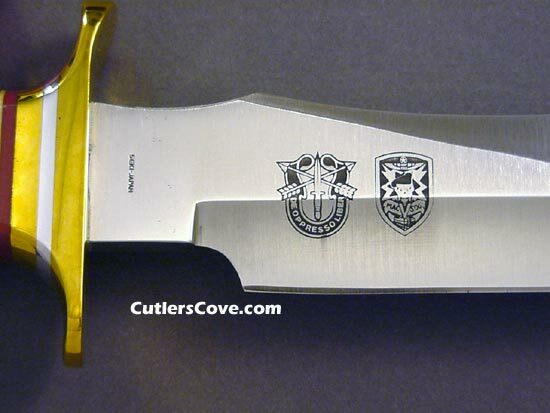 During the Vietnam conflict, the U.S. Army's Special Forces commissioned a combat knife for members of its S.O.G. (Studies and Observation Group) teams. These were made in Okinawa and bear no maker's markings. This is Al Mar's homage to that knife and the forces that used it. It is made better than the original! Initiated by Colonel Nick Rowe, creator of the Special Operations Command's SERE (Survive, Escape, Resistance, Evasion) School at Fort Bragg, North Carolina, capable of meeting the stringent demands required in combat/survival situations.